After a worker applies lacquer to the cabinet surface, the robot uses an end-of-arm buffing toll to perform the initial polishing. The worker checks whether the robot has done an adequate amount of work before he does the final polishing. Consumers have always wanted their stereo speakers to sound great. Increasingly, they want the speakers to look great as well. Paradigm Electronics Inc., based in Mississauga, Ontario, is dedicated to manufacturing speakers that meet both criteria. Founded in 1982, Paradigm makes a wide range of high-quality loudspeakers for home theater systems at its 220,000-square-foot Canadian facility. It also produces powered subwoofers, audio furniture and cables, and related accessories. The company exports its products to the United States, Australia, New Zealand, and throughout Europe (Denmark, Finland, Iceland, Norway, UK, Sweden) and Asia (Hong Kong, Japan, Malaysia, Taiwan). In the fall of 2014, the company began offering some speaker cabinet models, such as the Prestige, with a Midnight Cherry finish. Oleg Bogdanov, director of product development at Paradigm, says the market response was quick and positive. 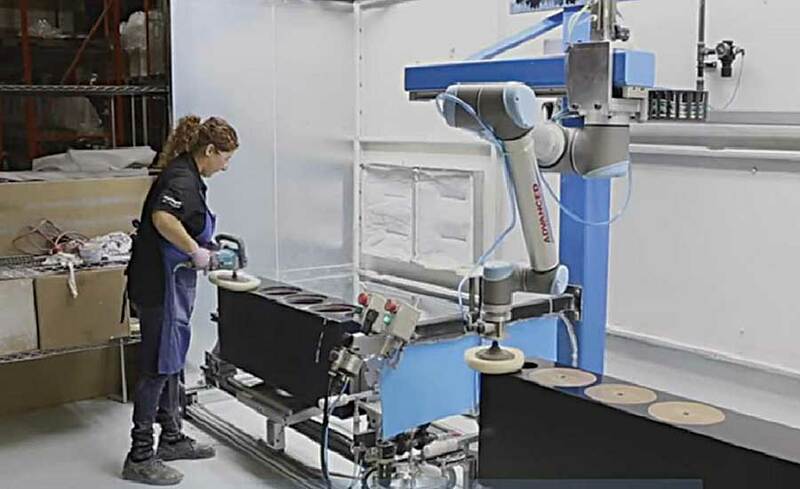 To solve this problem, Paradigm management considered the use of a robot due to the company’s positive experience with a Cartesian robot that performs different assembly work. However, the company quickly realized that a Cartesian robot wasn’t a good fit for this application because it requires protective devices around it to keep nearby workers safe. Company representatives then met with Ben Pinto, technical sales representative at robotics specialist Advanced Motor & Controls. Pinto recommended Paradigm look into the six-axis UR10 collaborative robot from Universal Robots. Further research into other collaborative robots showed that the UR10 was cost-effective, easy to install and complied with all local health and safety requirements. Since Paradigm installed the robot in 2015, Bogdonav says it has increased production of Midnight-Cherry-finish cabinets by 50 percent. After a worker applies lacquer to the cabinet surface, the robot uses an end-of-arm buffing tool to perform the initial polishing. The worker checks whether the robot has done an adequate amount of work before he does the final polishing. “It’s a very hand-in-hand kind of operation between the two as they safely interact,” says Phillips. He cites two robot features as the most important. One is built-in force control, which ensures the application of consistent pressure during polishing to prevent surface overheating. Another is easy programming. A worker trains the robot by simply positioning it in the sequence that it needs to move during operation. Saved programs are quickly recalled on a 12-inch touch screen.